The U.S. Navy's latest budget justification documents reveal plans to award the fourth contract under the Virginia-class submarine program in April, Inside Defense reported Wednesday. 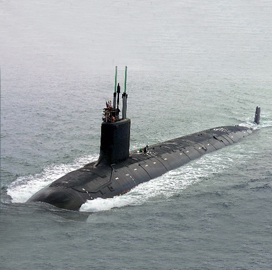 The contract calls for 10 nuclear-powered submarines in the Block V configuration and cover fiscal years 2019 through 2023. All of these future units would include acoustic superiority modifications, and seven among them will feature the Virginia Payload Module, a four-tube launcher made to shoot out 28 missiles. The Virginia Payload is designed to make up for the retirement of the Navy's guided missile submarines in the mid-2020s, the documents reported.